Accepted for publication 11 September 2009. Published 18 November 2009. Amiri, A., Brannen, P. M., and Schnabel, G. 2009. Validation of the lipbalm tube assay for evaluation of fungicide sensitivity in field isolates of Monilinia fructicola. Online. Plant Health Progress doi:10.1094/PHP-2009-1118-01-RS. Simple and rapid techniques for monitoring fungicide sensitivity of pathogen populations can be helpful to optimize spray programs. In this study, a lipbalm tube assay developed previously in our laboratory was investigated for shelf life duration, ability to differentiate M. fructicola from fungal contaminants, and ability to accurately determine the sensitivity offield isolates of Monilinia fructicola to sterol demethylation inhibitor (DMI), benzimidazole (BZI), and quinone outside inhibitor (QoI) fungicides. The sensitivity of isolates with different DMI, BZI, and QoI sensitivity phenotypes to the above-mentioned fungicide classes was not altered on agar disks sliced from 30-day-old, fungicide-amended potato dextrose agar (PDA) tubes stored at 4°C compared to disks from freshly prepared fungicide-amended PDA. At the storage temperature of 22°C, however, the sensitivity started to decrease after 10 days. Colony growth of M. fructicola on PDA disks was visually distinguishable from Alternaria alternata, Aspergillus niger, Cladosporium herbarum, Gilbertella persicaria, Penicillium expansum, and Rhizopus stolonifer but not Colletotrichum acutatum after 72 h of incubation at 22°C. The sensitivity of 40 M. fructicola field isolates to DMI, BZI, and QoI fungicides was determined by direct inoculation of lipbalm tube disks with conidia from field-derived peach fruit with toothpicks under semi-sterile conditions and by the traditional Petri dish assay. A strong correlation was observed between the two assays in determining fungicide sensitivity of M. fructicola field isolates. Because of its simplicity and reliability, the lipbalm tube assay will be a useful tool for trained crop consultants to determine orchard-specific resistance profiles outside a research laboratory for precision brown rot management. Management of pre-harvest brown rot disease, caused by Monilinia fructicola, depends primarily on the application of two or three fungicide applications in the final three weeks preceding harvest. Sterol demethylation inhibitor (DMI), quinone outside inhibitor (QoI), and to a lesser degree benzimidazole (BZI) fungicides are most commonly used for the control of pre-harvest brown rot in the Southeast (7), but their single-site modes of action make them prone to resistance development. Resistance to BZIs was reported not long after they were introduced in the late 1970s (8,16,25). More recently, resistance to DMIs has been reported in Georgia, South Carolina, Ohio and New York (12,17,21,24). The QoI fungicides azoxystrobin and pyraclostrobin (the latter is co-formulated with the carboximide fungicide boscalid) were registered for brown rot control almost a decade ago, but to date, field resistance in M. fructicola has not been reported to these fungicides. However, DMI-resistant strains may adapt to QoI fungicides at an accelerated speed (13). The explosive nature of brown rot epidemics and the associated risk for the stone fruit industry warrant the development of a simple and rapid resistance detection method suitable for use by crop consultants. Detection of resistance in fungal populations is most commonly performed by determining the sensitivity of single-spore isolates to fungicides in Petri dish assays. However, the traditional Petri dish assay (3) is time consuming, requires single-spore isolation, culture transfer and incubation, consumes a large amount of media and must be conducted in a sterile environment to avoid contamination. The Petri dish method, in some instances, may be replaced by polymerase chain reaction (PCR) based approaches to screen for resistance associated with mutations or genetic elements linked to gene overexpression (9,18,23). Such PCR-based techniques, however, require highly skilled personnel to operate specialized and expensive laboratory equipment. In a previous study, single-spore laboratory cultures of M. fructicola isolates with different fungicide resistance phenotypes were used to compare three agar-based assays. Results were similar for the traditional Petri dish and the lipbalm tube assays, with the latter being faster in assessing fungicide sensitivity. Results were obtained within 48 h compared to 96 to 120 h for the traditional Petri dish assay (1). The goal of this study was to assess and validate the lipbalm tube assay for fast determination of fungicide sensitivity in M. fructicola field isolates. Specific objectives were: (i) to determine the effect of storage temperature and duration on the accuracy of the lipbalm tube assay; (ii) to generate a visual aid for distinction of M. fructicola from common peach contaminants on agar disks; and (iii) to evaluate the accuracy of the lipbalm tube assay in assessing the sensitivity of M. fructicola isolates using field-infected peach fruit as an inoculum source. The sensitivity of five M. fructicola isolates (Mf.99.O3, Mf.Bmpc9, 190, ms15, Mf.R8.77) to fungicides was determined at two different temperatures on freshly prepared (0 days) and 10, 20, and 30 day-old agar disks. A total of 70 lipbalm tubes (15 mm in diameter, 60 mm in length; SKS Bottle & Packaging Inc., Watervliet, NY) containing potato dextrose agar (PDA, EMD Chemicals Inc., Gibbstown, NJ) or PDA amended with different fungicides were prepared as described previously (1). PDA was amended with propiconazole (Orbit 3.6EC, Syngenta Crop Protection, Greensboro, NC) at 0.3 and 2 µg/ml; thiophanate-methyl (Topsin-M WSB, Ceraxagri, King of Prussia, PA) at 1 and 50 µg/ml, and azoxystrobin (Abound 2.08F, Syngenta Crop Protection) at 1 and 35 µg/ml. The propiconazole and thiophanate-methyl concentrations were chosen based upon previous sensitivity characterization in M. fructicola isolates to these fungicides (14,21). The 1 µg/ml concentration of azoxystrobin was chosen because baseline EC50 values were found to be generally lower than that dose (20). The high dose was chosen to screen for high levels of resistance. To suppress the alternative oxidase pathway, salicylhydroxamic acid (SHAM) was added at 100 µg/ml to azoxystrobin-amended PDA (22). The lipbalm tubes were labeled and divided into two batches of 35 lipbalms each (5 of each fungicide concentration plus 5 PDA-controls). The batches were stored at 4°C or 22°C (room temperature). 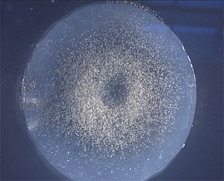 Mycelial growth inhibition was determined on agar disks as described previously (1). Data obtained from the two experimental runs on the effect of storage conditions on lipbalm tube assay performance did not differ significantly (P = 0.05) based upon a separate ANOVA test, thus the data from two independent experiments were combined. Means of percent inhibition from 10 replicates across two experimental runs and 95% confidence intervals (CIs) were computed for statistical evaluation. Temperature and duration of tube storage influenced the performance of the lipbalm tube assay. When tubes were stored at 4°C for 20 days, no significant decrease in mycelial growth inhibition was observed regardless of the isolate and fungicide (Fig. 1). After 30 days of storage at 4°C, the mycelial growth inhibition decreased numerically for all isolates and fungicides tested, but significant effects (P = 0.05) were only observed for the lab mutant Mf.R8.77 at 1 µg/ml azoxystrobin (Fig. 1). On the other hand, significant decreases (P = 0.04) in mycelial growth inhibition were observed after 20 days of storage at 22°C for all test isolates except for Mf.Bmpc9 at 0.3 µg/ml propiconazole and Mf.ms15 at 1.0 µg/ml thiophanate-methyl. A sharp decrease in the inhibition rate was observed for the laboratory developed mutant (Mf.R8.77) grown on 1 µg/ml azoxystrobin after only 10 days at 22°C. After 30 days of storage, mycelial growth inhibition at 22°C was significantly (P = 0.03) decreased for most isolate/fungicide combinations compared to 4°C. Fig. 1. Mycelial growth inhibition (%) of Monilinia fructicola isolates on agar disks amended with propiconazole, thiophanate-methyl, and azoxystrobin following storage at 4°C and 22°C. Data points are the means of five replicates per isolate/temperature/fungicide combination across two experimental runs. Vertical bars are the standard deviations. DMI = sterol demethylation inhibitor; BZI = benzimidazole; QoI = quinone outside inhibitor; S = sensitive to all fungicides; R = resistant; LR = low resistance; HR = high resistance, RS = reduced sensitivity. Morphological profiles of seven fungal contaminants commonly encountered on peach fruit in addition to M. fructicola were established on agar disks. Conidia from Aspergillus niger, Cladosporium herbarum, Gilbertella persicaria, Penicillium expansum, and Rhizopus stolonifer were produced on PDA after 3 to 4 days of incubation at 22°C. Conidia from Alternaria alternata and M. fructicola were produced on V8-agar and acidified PDA adjusted to pH 4.0 with lactic acid, respectively. Colletotrichum acutatum was grown on PDA for 7 days in the dark at 22°C and subsequently exposed to a 12 h photoperiod for at least 10 days to stimulate sporulation. 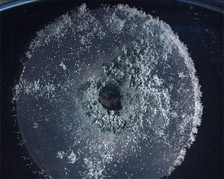 Disks were sliced (3 mm thickness) from lipbalm tubes containing unamended PDA, placed in Petri dishes and inoculated with conidia from each fungus as described previously (1). 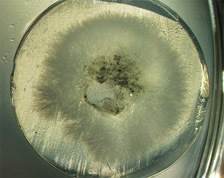 Three replicate disks were inoculated for each fungus. 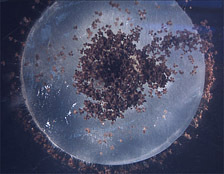 Representative disks were photographed daily for 3 days using a digital camera mounted on a stereomicroscope (SZX-ILLK100, Olympus America Inc. Center Valley, PA). Isolates of M. fructicola and seven other potential fungal contaminants of peach grew readily on unamended agar disks and phenotypic characteristics allowed visual distinction between M. fructicola and the potential contaminants. M. fructicola was visually distinguishable from 6 test fungi with the exception of A. alternata and C. acutatum after 48 h of incubation (data not shown). After 72 h of incubation, A. alternata produced distinct dark green sporulating colonies distinguishable from M. fructicola (Fig. 2). At this time, M. fructicola remained difficult to distinguish visually only from C. acutatum. However, compared to C. acutatum, M. fructicola produced abundant aerial mycelium and grew faster (Fig. 2). Fig. 2. Mycelial growth and colony morphology of Monilinia fructicola and common fungal contaminants of peach after 72 h at 22°C on PDA lipbalm disks as observed under a stereomicroscope (7.5×). 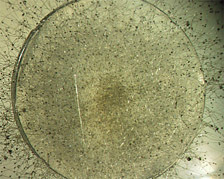 Conidia of each isolate were collected using a sterile toothpick used to inoculate the inner circle of the respective agar disk. Peaches with brown rot symptoms were collected in 2007 from four orchards in the Fort Valley region, Georgia (80 fruit), and seven orchards in Spartanburg, Greenville, Saluda and Edgefield counties, South Carolina (160 fruit). Spartanburg and Greenville counties belong to South Carolina’s northern ‘Piedmont’ area, whereas Saluda and Edgefield counties are located in the center of South Carolina representing part of the ‘Ridge.’ Fruit were placed separately in plastic containers with the sporulating lesion facing up, covered with lids to prevent spore dispersal, and transferred to a workplace. Sensitivity of M. fructicola isolates to propiconazole, thiophanate-methyl, and azoxystrobin at the concentrations described above was evaluated using the lipbalm tube assay (1), except that sterile, wooden toothpicks were used for inoculation. Toothpicks reduced the number of potential contaminants collected from a sporulating lesion (data not shown) compared to pressing the PDA core to the sporulating surface as previously suggested (11). Furthermore, the assays were performed on lab benches cleaned with chlorox wet wipes, not under a sterile laminar flow hood. From the 240 isolates, 40 (28 from South Carolina and 12 from Georgia) showing variability in sensitivity to fungicides on lipbalm disks were selected to compare the lipbalm tube assay with the traditional Petri dish assay. Mycelial growth was measured after 48 and 72 h, and growth on fungicide-amended disks was expressed relative to the non-amended control. An isolate was considered resistant to propiconazole (0.3 µg/ml) and thiophanate-methyl (50 µg/ml) or reduced sensitive to azoxytrobin (1 µg/ml) if relative growth was greater than 50%. Sensitivity of field isolates to DMI, BZI, and QoI fungicides was expressed as percent growth relative to the control. All values of each method were ranked and a Spearman product moment correlation coefficient was calculated using SigmaStat software (Version 3.00, SPSS Inc., Chicago, IL). Common contaminants of PDA disks observed on early ripening (June) and late ripening (August) varieties were identified based standard taxonomic keys. 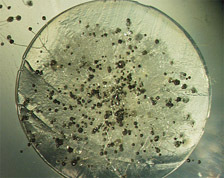 Contaminants showing slow growth or those with unfamiliar morphological features were transferred aseptically to PDA Petri dish plates, incubated for 7 days and identified based on colony and conidia morphology. Contaminants remaining unidentified at this point were characterized by amplifying and sequencing the ribosomal Intergenic Spacer Regions ITS 1 and ITS 2 as described previously (10). There was a strong positive correlation between the Petri dish and the lipbalm tube assays when results of all fungicide treatments were combined (r = 0.969). The lipbalm tube and the Petri dish assays showed comparable relative growth values for almost all test isolates grown on PDA amended with 0.3 µg/ml propiconazole, 50 µg/ml thiophanate-methyl or 1 µg/ml azoxystrobin. Differences in isolate sensitivity between the two assays were only observed in three cases, i.e. thiophanate-methyl sensitivity of one isolate and azoxystrobin sensitivity of two isolates. Comparable relative growth values (within 10%) were observed in 100% of all cases between the Petri dish and lipbalm tube assays when PDA was amended with 2 µg/ml propiconazole and 35 µg/ml azoxystrobin, whereas comparable growths were observed in 94.6% of all cases for the 1 µg/ml thiophanate-methyl treatment (data not shown). Lipbalm tube disks were less contaminated during June collections (average incidence of contaminants, 4.2%) compared to August collections (14.1%; Table 1). Cladosporium sp., Alternaria sp., and Rhizopus sp. constituted 70.9, 12.7, and 4.0%, respectively, of the total contaminants in the early varieties (June) versus 18.8, 11.0, and 57.8%, respectively, in the late varieties (August, Table 1). Generally, more contaminations were observed on unamended PDA disks followed by propiconazole-, azoxystrobin- and thiophanate-methyl-amended disks, respectively (data not shown). Aspergillus, Gilbertella, and Phomopsis species were only observed on disks inoculated from late peach varieties (Table 1). Other detected fungal contaminants were Epicoccum, Aureobasidium, and Phythophthora (data not shown). Table 1. Incidence (%) of common fungal contaminants from peach fruit detected on lipbalm tube disks. The lipbalm tubes remained accurate for 30 days following refrigeration at 4°C. The colder storage temperature likely delayed fungicide degradation, resulting in a longer storage period without losing assay accuracy. Earlier studies reported that fungicide degradation is influenced by evaporation, pH, solubility, temperature, and light (2,5,6). Likewise, degradation of five triazoles including propiconazole was 3-fold higher as temperature was increased from 5 to 18°C (4). Little to no decrease in test accuracy was observed after 30 days of storage on PDA-disks amended with the higher dose of each fungicide regardless of the storage temperature (data not shown). In those cases, not enough fungicide may have degraded to alter the test results significantly. A drawback of working with nutrient-rich, complete medium and field-derived inoculum is the potential for contamination. 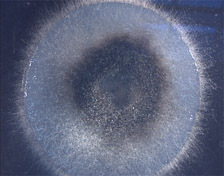 Fungal contaminants may grow on unamended or even fungicide-amended PDA if they are resistant to the test fungicides, which may result in false positives in the lipbalm tube assay. In this study, conidia were collected from field-infected peach fruit, but contamination was minimal. The use of the small tip surface of sterile toothpicks rather than cotton swabs (1) to collect spores from sporulating areas of the fruit helped to keep contamination to a minimum, likely due to less contact with the fruit surface. The incidence of contaminants increased when fruit were collected later in the season, probably related to a progressive built up of different fungal populations as is generally observed on the peach surface and other peach organs as the summer progresses (15,19). The visual aid to distinguish M. fructicola from other potential fungal species will be helpful especially for users with little to no mycology background. M. fructicola was clearly distinguishable visually from potential fungal contaminants of peach fruit on PDA disks after 72 h of incubation with the exception of Colletotrichum acutatum, the causal agent of anthracnose of peach and other fruits. 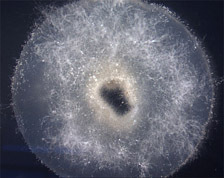 However, C. acutatum grew slowly tightly appressed to the disk surface compared to M. fructicola which produced abundant greenish-white aerial mycelium. Moreover, C. acutatum was not found to be a major contaminant of PDA disks in our study, which may therefore alleviate the problem of having to distinguish the two fungi on agar disks based on morphological characters. In conclusion, we demonstrate that (i) the fungicide-amended agar in lipbalm tubes can be used for at least 4 weeks when refrigerated; (ii) the assay can be conducted under semi-sterile conditions using toothpicks to transfer spores from field-derived fruit; and (iii) most common contaminants can easily be distinguished visually after 72 h of incubation. In light of existing and emerging fungicide resistance problems in the brown rot fungus, the lipbalm tube assay will be a useful tool mainly for crop consultants like county agents and extension specialists to make science-based recommendations for chemical pre-harvest brown rot control. Technical contribution number 5511 of the Clemson University Experiment Station. This material is based upon work supported by USDA-CSREES under project number SC-1000642. This research was funded in part by the USDA-CSREES S-RIPM program grant no. 2006-34103-17007. We thank M. Hotchkiss, USDA-ARS, Byron, GA, and T. J. Michailides, University of California, Davis, for providing some of the isolates used in this study, and P. K. Bryson, Clemson University, for technical assistance. 1. Amiri, A., Scherm, H., Brannen, P. M., and Schnabel, G. 2008. Laboratory evaluation of three rapid, agar-based assays to assess fungicide sensitivity in Monilinia fructicola. Plant Dis. 92:415-420. 2. Anfossi, L., Sales, P., and Vanni, A. 2006. Degradation of anilinopyrimidine fungicides photoinduced by iron (III)-polycarboxylate complexes. Pest Manag. Sci. 62:872-79. 3. Anonymous. 1991. FRAC methods for monitoring fungicide resistance. Eur. Medit. Plant Prot. Org. Bul. 21:291-354. 4. Bromilow, R. H., Evans, A. A., and Nicholls, P. H. Factors affecting degradation rates of five triazole fungicides in two soil types: 1. Laboratory investigations. Pest. Sci. 55:1129-1134. 5. Coiffard, C., Coiffard, L. J. M., and De Roeck-Holtzhauer, Y. 1997. Influence of pH on the thermodegradation of acesulfam-K in aqueous diluted solutions. STP Pharma Sci. 382:85. 6. Garau, V. L., Angioni, A., and Del Real, A. G. 2002. Disappearance of azoxystrobin, pyrimethanil, cyprodinil, and fludioxonil on tomatoes in a greenhouse. J. Agri. Food Chem. 50:1929-1932. 7. Horton, D., Brannen, P. M., Bellinger, B., and Ritchie, D. 2009. 2009 Southeastern peach, nectarines and plum pest management and culture guide. Bull. 1171. Univ., of Georgia, Athens, GA.
8. Jones, A. L., and Ehret, G. R. 1976. Tolerance to fungicides in Venturia and Monilinia of tree fruit. Proc. Am. Phytopathol. Soc. 3:84-89. 9. Kim, Y. S., Dixon, E. W., Vincelli, P., and Farman, M. L. 2003. Field resistance to strobilurin (QoI) fungicides in Pyricularia grisea caused by mutations in the mitochondrial cytochrome b gene. Phytopathology 93:891-900. 10. Kwaśna, H., Ward, E., and Bateman, G. L. Phylogenetic relationship among zygomycetes from soil based on ITS1/2 rDNA sequences. Mycol. Res. 110:501-510. 11. Lalancette, N., Russo, J. M., and Hickey, K. D. 1984. A simple device for sampling spores to monitor fungicide resistance in the field. Phytopathology 74:1423-1425. 12. Luo, C.-X., Cox, K. D., Amiri, A., and Schnabel, G. 2008. Occurrence and detection of the DMI resistance-associated genetic element ‘Mona’ in Monilinia fructicola. Plant Dis. 92:1099-1103. 13. Luo, C.-X., and Schnabel, G. 2008. Adaptation to fungicides in Monilinia fructicola isolates with different fungicide resistance phenotypes. Phytopathology 98:230-238. 14. Ma, Z., Yoshimura, M. A., and Michailides, T. J. Identification and characterization of benzimidazole resistance in Monilinia fructicola from stone fruit orchards in California. Appl. Environ. Microbiol. 29:7145-7152. 15. Melgarejo, P., Carrillo, R., and Sagasta, E. M. 1985. Mycoflora of peach twigs and flowers and its possible significance in biological-control of Monilinia laxa. Trans. Brit. Mycol. Soc. 85:313-317. 16. Ogawa, J. M., Manji, B. T., Bostock, R. M., Cañez, V. M., and Bose, E. A. 1984. Detection and characterization of benomyl-resistant Monilinia laxa on apricots. Plant Dis. 68: 29-31. 17. Parker, D. M., Zhang, N., Smart, C. D., and Köller, W. D. 2006. Polymorphism of 14 alpha-demethylase gene (CYP51) in brown rot pathogen Monilinia fructicola from a resistant orchard in New York State. (Abstr.) Phytopathology 96:S90. 18. Pasche, J. S., Piche, L. M., Gudmestad, N. C. 2005. Effect of F129L mutation in Alternaria solani on fungicides affecting mitochondrial respiration. Plant Dis. 89:269-278. 19. Phillips, D. J., and Harvey, J. M. 1975. Selective medium for detection of inoculum of Monilinia spp. on stone fruits. Phytopathology 65:1233-1236. 20. Schnabel, G., Dai, Q., and Paradkar, M. R. 2003. Cloning and expression analysis of the ATP binding cassette transporter MFABC1 gene and the alternative oxidase gene MfAOX1 from Monilinia fructicola. Pest Manag. Sci. 59:1143-1151. 21. Schnabel, G., Bryson, P. K., Bridges, W. C., and Brannen, P. M. 2004. Reduced sensitivity in Monilinia fructicola to propiconazole in Georgia and implications for disease management. Plant Dis. 88:1000-1004. 22. Shamoun, S. F., and Sieber, T. N. 1993. Isozyme and protein-patterns of endophytic and disease syndrome-associated isolates of Melanconium apiocarpum and Melanconium marginale collected from alder. Mycotaxon 49:151-166. 23. Sierotzki, H., Wulldchleger, J., and Gisi, U. 2000. Point mutation in cytochrome b gene conferring resistance to strobilurin fungicides in Erysiphe graminis f. sp. tritici field isolates. Pest. Biochem. Physiol. 68:107-112. 24. Zehr, E. I., Luszcz, L. A., Olien W. C., Newall, W. C., and Toler, J. E. 1999. Reduced sensitivity in Monilinia fructicola to propiconazole following prolonged exposure in peach orchards. Plant Dis. 83:913-916. 25. Zehr, E. I., Toler J. E., and Luszcz L. A. 1991. Spread and persistence of benomyl- resistant Monilinia fructicola in South Carolina peach orchards. Plant Dis. 75:590-93.